The line graph shows how many people in London travel by Underground train in each different time of day from 6 am to 10 pm. Overall, it is clear that 8:00 o’clock and 18:00 o’clock are the most crow moment of day while the most quite time of day is at 6 am and 4 pm. In the morning, the number of passenger is 100 at 6 am. During 2 hours, this number is increased significantly to reach a peak at 400 at 8 am. Then, there was a rapid drop to roughly 200 users at 10 am. From 10 am to 02 pm, there is a slight rise in the number of passengers from just under 200 passengers to 300 passengers. 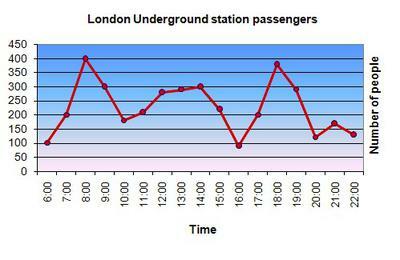 In the afternoon, a dramatic fall in the number of passenger from 02 pm to 04 pm, with just under 100 passengers. This number is soared again to reach about 350 passengers at 06 pm and go down sharply to about 150 passengers at 20:00. During 2 last hours, the number is fluctuated around 150 passengers.